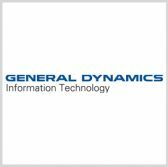 General Dynamics‘ information technology business has received a $50 million option under a previously awarded indefinite-delivery/indefinite-quantity contract for logistics support services to multiple foreign military sales customers. The Defense Department said Wednesday GDIT will provide the FMS logistics services in support of the Naval Air Systems Command’s Logistics Management Integration Department. Work will take place in various within and outside the continental U.S.
GDIT is scheduled to complete work under the exercised option in October 2023.